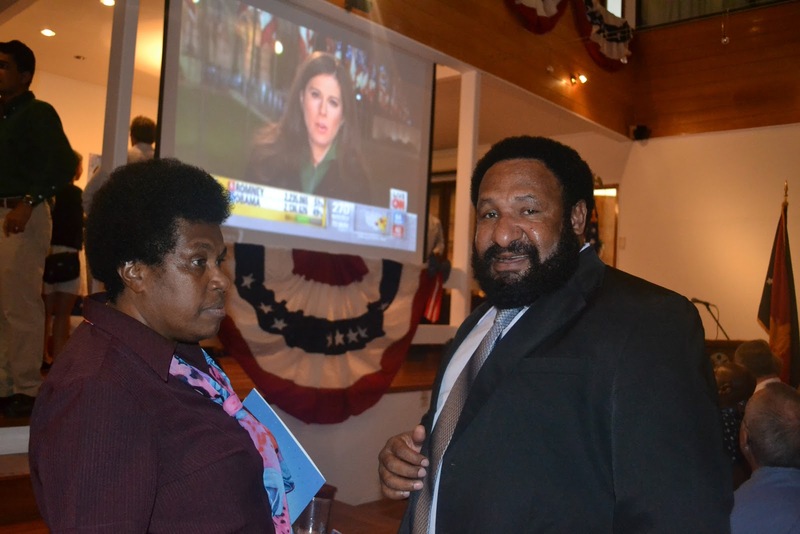 TREASURER Don Polye led a team of Ministers, MPs, business and diplomatic dignitaries to view the results of the American Presidential Election live on Television in Port Moresby yesterday. Mr Polye, who later gave his congratulatory message to the people of the United States of America for retaining President Barrack Obama, said that the PNG Government was watching the elections with great interest because of the fact that America controlled the economy which also affects PNG. He was asked earlier which candidate he supported or was backing to win the Presidential Seat, and said he did not care who won the elections as long as PNG was happy to work with whoever had won. “The American economy is important for us (Papua New Guinea). If Mitt Romney wins it would be good for us in PNG because the Republican policies centre on big busineses creating businesses and that is to grow the economy. If Obama won we would also work with him because the Democrats, and their policies are on taxes and sharing wealth with the low and middle income earners,” Mr Polye said. “In PNG both policies are relevant and we are also looking at similar kinds of polices for our country…. at the same time we have to empower our rural people. PNG will be happy to work with whoever wins,” he said. After the declaration Mr Polye gave a brief congratulatory message, however, an official congratulatory message will be conveyed by the acting Prime Minister Leo Dion, who is now in charge, after Prime Minister Peter O’Neill left for Bali this week. National Planning Minister Charles Abel was also there, including Defence Minister Dr Fabian Pok, Fisheries and Marine Resource Minister Mao Zeming, Sohe MP Delilah Gore, vice Minister for Sports Labi Amaiu and many other important dignitaries.